Painting Acrylic on Canvas | 192" x 72"
Painting Acrylic on Canvas | 74" x 77"
Painting Acrylic on Canvas | 98" x 50"
Painting Acrylic on Canvas | 38" x 47"
Painting Acrylic on Canvas | 47" x 69"
I play with my subconscious mind to deliver my unique paintings. My daily life experiences form the foundation of my work, however, I do not choose to draw the actual images rather my emphasis is upon the feelings and emotions generated because of the events that took place. My paintings will always be highly visually appealing, owing to the extravagant use of colours, shades and assorted techniques. Through my art, I want to infuse the feeling of peace in the soul and mind of the audience which in a way, can be termed as colour therapy to the mind. Ghanshyam Gupta is a well-known artist, painter and sculptor among the artist circle. Gupta holds degrees in Printmaking from Royal College of Art, London, M.S. from University of Baroda and B.F.A Painting from Government School of Art, Aurangabad. He has participated in a large numbers of exhibitions, slide shows, camps, workshops and lectures. His artistry and finesse has been displayed through his solo as well as group shows all over India and abroad. 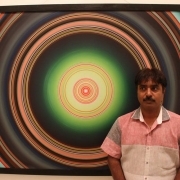 Many notable personalities in London, New Delhi and Bangalore are proud collectors of his mesmerizing art works.